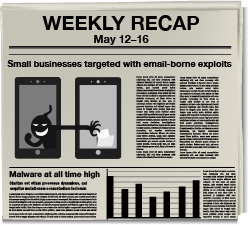 "Just a couple of days ago, we spotted a new wave of spam emails spewing malicious PDF files. The decoy, which purports to be an invoice, is directly attached to an email targeting small businesses[.]" "Several vulnerabilities for Windows, some critical, which certainly affect Windows XP, not patched there. Office 2003 also unpatched for less-severe bugs. Three new zero-day vulnerabilities are revealed." "Embedding some information security practitioners within business units could help improve IT security awareness in many enterprises, reducing security risk, says Steve Durbin, global vice president of the Information Security Forum." "One way to stay safe is by knowing your own network, especially if you’ve outsourced your IT. Cloud hosting providers who offer a service layer should provide a comprehensive IT map of your network, usage, and future needs."